Cake Decor in Cairns: Aloha! 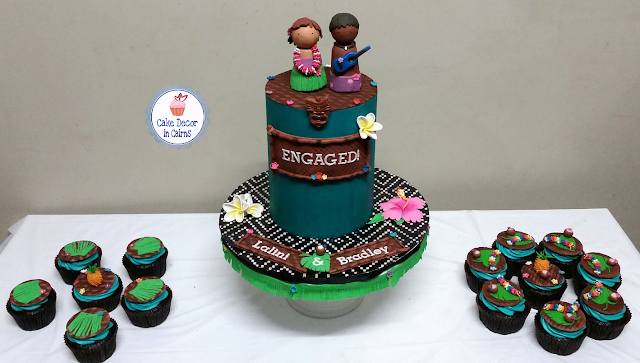 Luau Tropical Engagement Cake! Aloha! 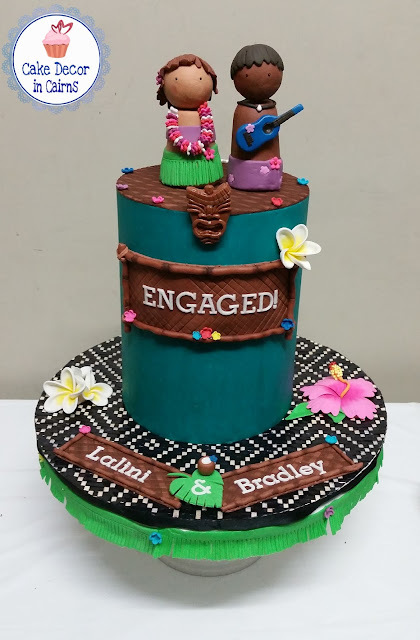 Luau Tropical Engagement Cake! I cannot believe it's been almost TWO YEARS since I last posted on my blog! Yes that's right 2 whole years! Have you missed me? I have most certainly missed you! If you're new to my little cake corner of the world - welcome! I have come back online because I wanted to share with you what I feel is my best cake ever! My niece's Luau Tropical themed Engagement Cake. 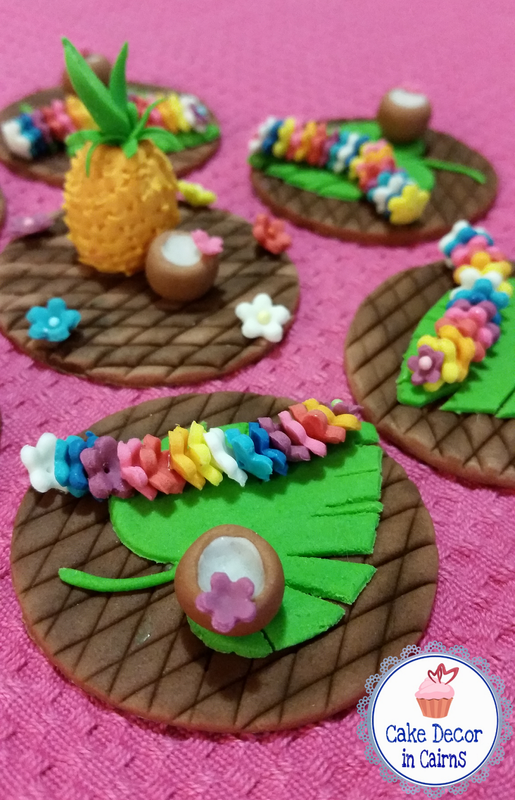 What started out as a simple idea to cross off making sugar / fondant frangipanis from my "cake bucket list" turned into a fully decked out Luau themed cake with all the tropical trimmings! Miniature fondant coconuts, flower lei necklaces, pineapples, Tiki mask, hibiscus and even a ukulele! Aloha! Luau Themed Engagement Cake. All the tropical fondant trimmings! Now I will not tell a lie - this cake took an incredible amount of time. As I said, it's the best cake I have ever made! And you know that "The Best!" isn't something I can pull off the night before. 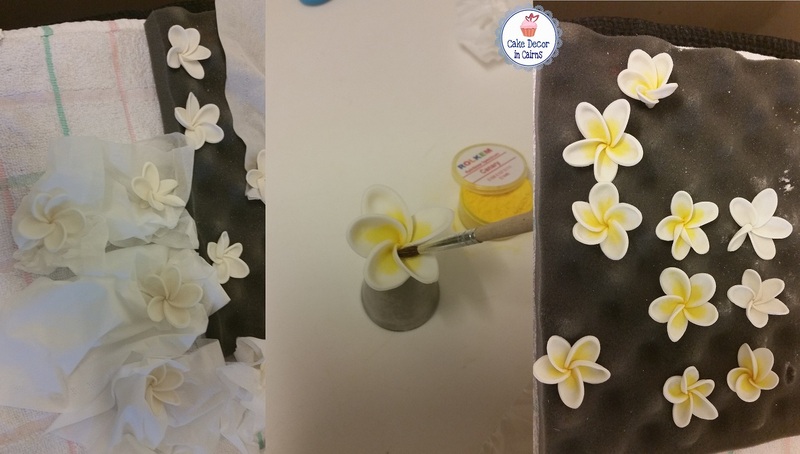 The very first edible item I made for this cake was the fondant / gumpaste frangipanis (plumeria) - one of my all time favourite flowers. Nothing screams more tropical than a beautiful frangipani. This theme is so close to my heart - considering that I live in the best tropical city in the world! I kid you not - these seemingly simple flowers were NOT so simple to make! I read a few tutorials, gumpaste flower books etc and rolled and destroyed MANY trial flowers! Every tutorial pretty much said the same thing "simply roll petals together" well ha ha jokes on me because every time I tried, my dear fingers seemed to squish each one! Eventually I figured out that I needed to work with each petal individually and extremely slowly to painstakingly get those petals to join in some kind of a frangipanni manner! Moral of the story? If at first you don't succeed try, try and try again. If you still don't succeed try experimenting and working with your own ideas and methods and keep trying until you win! Thankfully the other flowers were not so challenging, just time consuming, imagine punching out all those little fondant flowers you see pictured and then imagine yourself punching out about a thousand more! I had so many ideas I wanted to try so I made so many unnecessary extras "Just in case!" There are so many elements I want to share with you, however I feel I would end up writing a novel on just one cake tutorial! (No one's got time for that!) 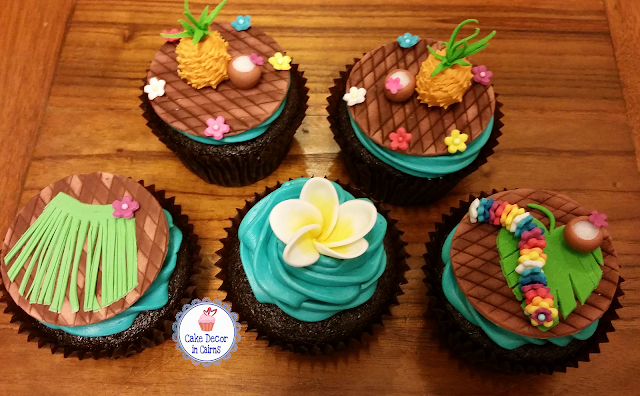 So let's have a quick look at some helpful tips when making Luau themed fondant toppers. To make these for the cupcake and cake toppers I used a Jem strip cutter. 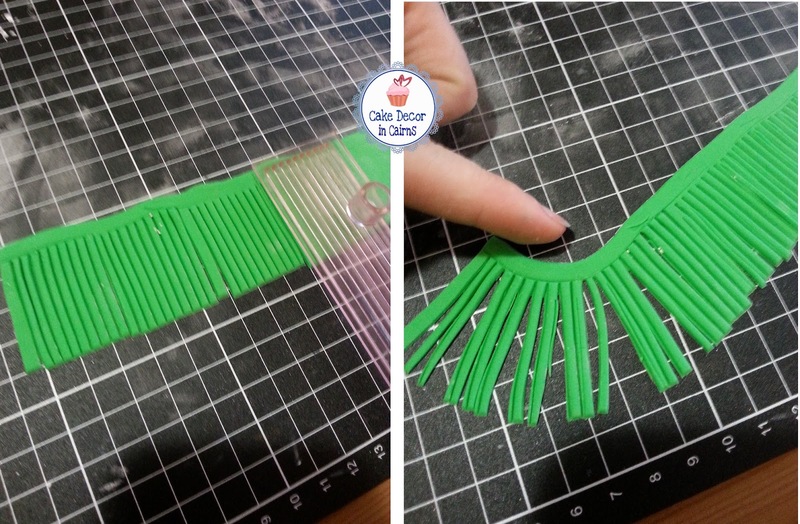 These sets are super useful for cutting strips (as the name says) in different widths. For this instance I used the skinniest one to make the grass strands of my skirt. 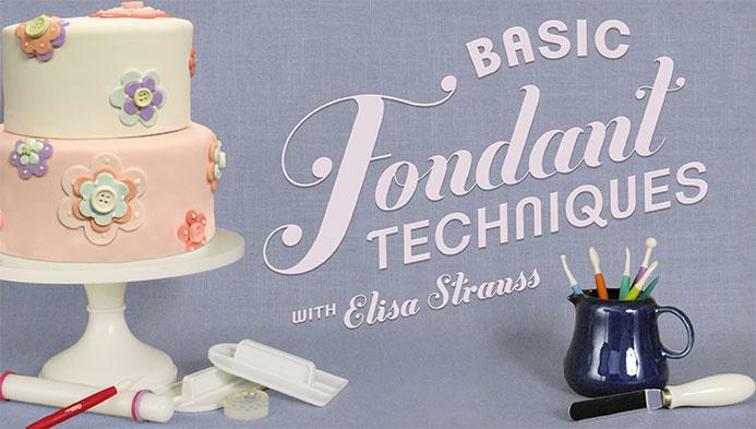 Make sure your fondant is rolled out thin and slightly dry for best results! To make the mat / weave look on my brown topper bases I also used Jem Strip Cutters to create a woven mat impression. I dusted every second line with brown edible dust as pictured. Cut out Circles, Gently imprint Strips - not too hard, and dust. 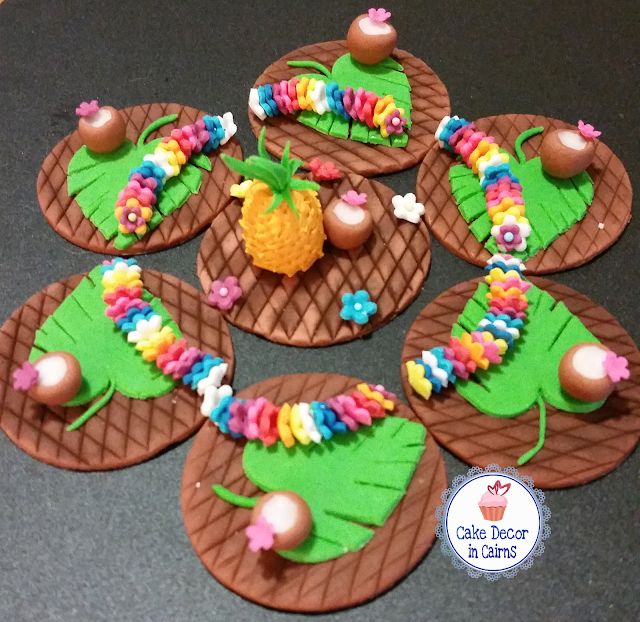 Edible Tropical Fondant Toppers! Aloha! It's Luau Time! Saving my favourite part to last, I had the most fun creating the main topper. I absolutely love wooden peg people so I jumped at the opportunity to make my very own fondant ones! 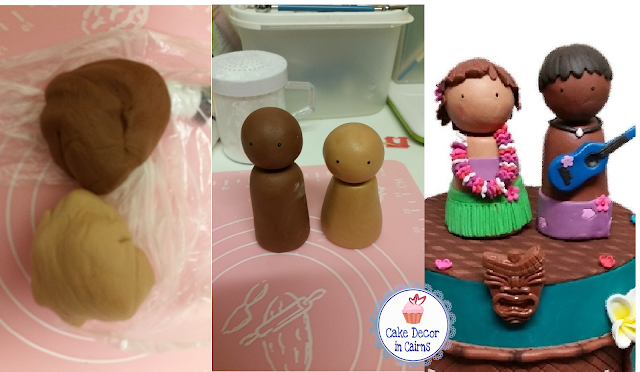 Complete with an edible flower necklace and blue ukulele, these are the cutest bride and groom to be luau cake toppers on the tropical block! In The beginning there were two shades of fondant! And of course it wouldn't be me if I didn't tell you that I used Teal Coloured Ganache to cover my cake in! I don't use special chocolate colourings - who has money to waste on more colours??! For this ganache I used normal Wilton Teal gel colour. If you're new to my signature cake covering style, you can check out my Coloured Ganache method by clicking here! Thank you for stopping by and sharing a bit of cake with me!